With more than three and up to 150 solar masses a star shines blue - the bigger and hotter the more intensive. These stars burn their fuel much quicker than their smaller fellows and for this are much more luminous. After a few to a few hundred million years they leave the main sequence and, except the most biggest, become red giants or supergiants. Very big ones of these don't expand so strongly when leaving the main sequence, stay blue, but become unstable. Blue stars are rather seldom but because of their brightness we can see many of them in the sky. Blue stars could have planets, but their life span is much too short to evolve life on this planets. 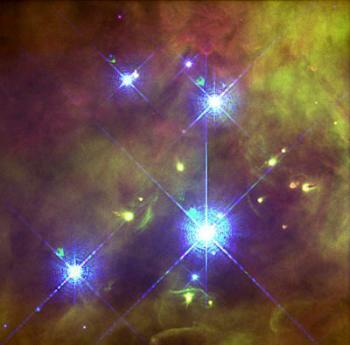 The Trapezium, the brightest stars in the Orion Nebula with Theta-1 Orionis C.